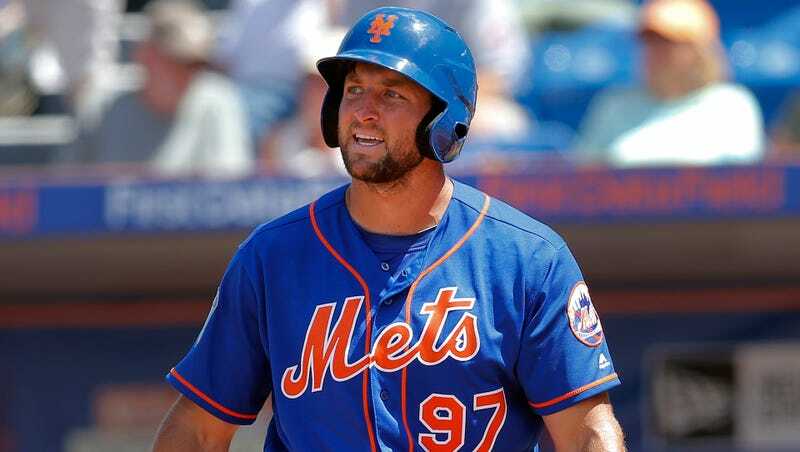 Mets farmhand Tim Tebow started at left field this afternoon in a spring training game against the Nationals and their ace Max Scherzer. Tebow will begin the season playing Class A ball with the Columbia Fireflies, but he’ll finish up spring training with the Mets, where he’s been having some issues with major league fastballs. Tebow went 0-for-4 this afternoon with 3 strikeouts. Earlier this month, Rick Porcello fed Tebow a steady diet of fastballs and they made his head spin. Scherzer kept him on the same meal plan today. The result was not pretty. Just a bit behind it there, Tim.